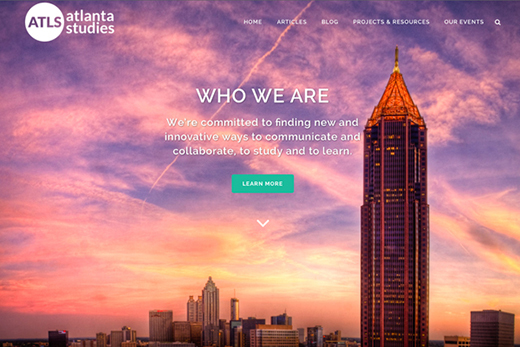 The new Atlanta Studies Network website was one of several Emory digital scholarship projects on display at "Teaching and the Digital Humanities," hosted at Emory by the American Academy of Arts and Sciences. Before participants gathered for the panel discussion exploring the digital humanities, they had a chance to experience it. Displays of computer monitors showcased new, recent and ongoing projects produced by Emory faculty and students in collaboration with the Emory Center for Digital Scholarship. Projects range from web magazines and peer-reviewed journals, such as "Sacred Matters" and "Southern Spaces," to extensive mapping projects and Readux Digital Scholarly Editions. The editions provide online access to unique books, ranging from Georgia State House and Senate journals to volumes on Methodism, Southern imprints, and an extensive collection of "Yellowbacks," cheap commercial paperbacks popularized in the 19th century..
Of special interest: A demonstration of The Battle of Atlanta Tour App, which identifies key local sites that figured in the fall of the Confederacy during the final year of the Civil War, and the new Atlanta Studies Network, a collaboration between Emory's Manuscript, Archives and Rare Book Library (MARBL), Emory faculty and graduate students with colleagues at Georgia State University, Kennesaw State University, the University of North Carolina at Chapel Hill, and the Atlanta History Center to present scholarship about the Atlanta metropolitan region. From students who help generate groundbreaking online scholarship to the use of Twitter and Tumblr to carry conversations beyond the classroom, the relationship between academic research and digital scholarship is changing, inviting engagement in new and innovative directions. That was the overwhelming message at "Teaching and the Digital Humanities," a panel discussion hosted April 2 by the American Academy of Arts and Sciences in collaboration with Emory University. The gathering of digital scholars and university leaders came to Emory through the creative vision of Academy member Ron Schuchard, Goodrich C. White Professor of English Emeritus at Emory, who proposed the event. By all accounts, the future of digital humanities is filled with promise, as new tools, technologies and teaching techniques are opening avenues to engage and inspire students to share scholarship on a broad, public scale. With those changes comes an opportunity to shape not only how courses are taught, but their very content, as students discover new tools to ask questions within the humanities, grapple with large data sets, navigate digital repositories, investigate digital culture within society, and use social media to engage with new audiences. The spring program was inspired by a challenge arising from work done by the Academy's Committee on Human and Social Sciences to assess the state of human and social science scholarship, said Academy President Jonathan Fanton. "The Heart of the Matter," an influential 2013 Academy report, endorsed broad public access to digital resources and recommended encouraging new partnerships to insure that all students have access to quality online research materials, he said. One of the nation's oldest and most prestigious honorary societies and a leading center for independent policy research, the Academy convenes leaders from the academic, business and government sectors to address issues facing the nation and world, including the humanities, culture and education. At Emory, digital scholarship in the humanities is "not just a momentary interest," rather "a topic we've been learning more and more about every day," said Emory President James Wagner. Through a myriad of projects and initiatives supported by the Emory Center for Digital Scholarship (see sidebar) — many of which were showcased in demonstrations prior to the program — "in fact, I think we may be pushing the envelope," Wagner said. Across the board, panelists spoke to the promise digital scholarship brings to the humanities, where opportunities are ripe to shape students not only as consumers of online content, but as producers, said Thomas, who served as the director of the Virginia Center for Digital History at the University of Virginia from 1998 to 2005. "Students need to understand how the medium operates, what it affords and what it doesn't afford," Thomas said. "I think humanities can lead the way." To illustrate, Thomas described how students emerged as early content producers for The Valley Project, a digital archive at the University of Virginia that details life in two American communities — one Northern and one Southern — during the Civil War. That led to the development of "digital history seminars," a phrase "we made up to describe what we were doing" and a chance to explore with students what historical scholarship might look like in cyberspace, Thomas recalled. Thomas said students eagerly seized the chance to share and publish their work. "And the public presence of their work (on the web) altered their engagement with their work," he said, noting that in many cases, his students continued to connect with content years after the course had ended. Through digital scholarship projects, Nieves has seen undergraduate students work alongside faculty as "significant research collaborators." Not only does that exposure enrich the undergraduate experience, it provides "research tools that have a straightforward application in our classrooms," he said. In fact, his own recent research — developing three-dimensional reconstructions of buildings during South African apartheid — "would not have been possible if not for the work we've been doing with students," he said. "If you take nothing else away, (know that) undergraduate student collaborators can do high-level scholarly research." Johnson also advocated "taking social media seriously" as part of pedagogy and learning. She asks undergraduates to publicly blog their reflections and shares course information on Tumblr and Twitter, adding new students with each class to an ongoing list of former students. "It ends up operating as a message board outside the classroom," she said. "They end up having really interesting conversations with each other, with the screen, they might not have had with me." Digital tools "present a cornucopia of choices," Johnson said. "Because of the depth and breadth of information happening online, it encourages students to take hold of the research process itself." Digital scholarship isn't without its growing pains. Access to technology in the classroom — along with uneven levels of student expertise with the technology — can present barriers, Johnson said. Some students may also associate Facebook, Twitter and Tumblr primarily with fun and recreation. Other issues still waiting to be resolved: Integrity of online data and how such scholarship can be accurately rated and evaluated. "We always have to be critical about where information is coming from — that's where the humanities are really important," said Cong-Huyen. For smaller liberal arts colleges with limited resources and little tradition with digital technologies, adapting new programs may seem daunting, but the rewards are definitely there, she noted. "We're trying to bring the ethos of digital humanities into classrooms across our campus," she said. "Our goals are to increase student engagement and produce more public-facing work. We want our students to take ownership of their work."